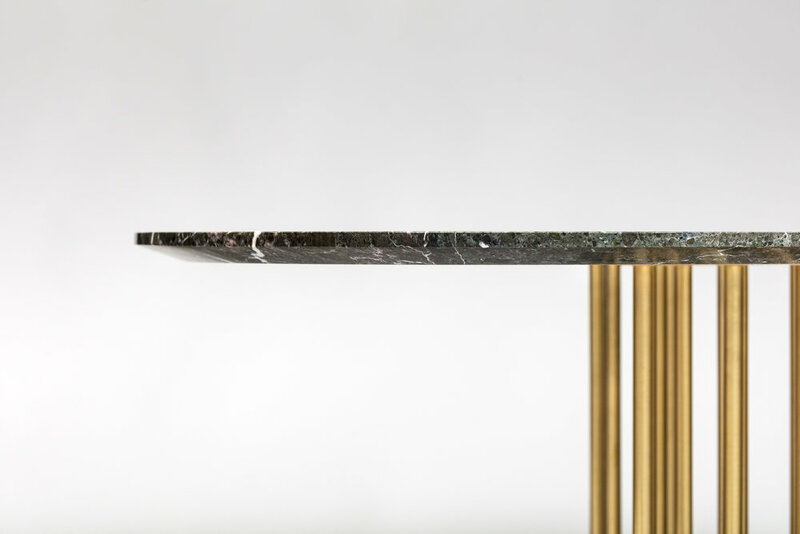 This collection features unique pieces of tables that aims to bring sensations to the individual space that inhabits it; through form, texture and reflections, rather than merely mimicking the natural forms. The everyday object becomes an individual piece of art to be looked at, to be touched, to be lived with. Inspired by the myth of Narcissus, it depicts the sensation of a morning in a forest, the encounter with a water lily floating on the water. The Naiades Collection questions and explores the concept of self image : The double reflection: the emblematic relationship of the parts to the whole, the flower to its leaf, the leaf to the water in an abstract manner. This ambiguous relationship of the metal leg and the solid plane of the table top, embrace the quality of the amphibious and lightness; whereas the reflections on the metal echoes the play of light on the water, celebrating a world of imagination that evoke curiosity. The dining table is the focal point of the interior space: Naiad dining table is an excellent statement art piece with it’s sophisticated sculptural form and material combinations. Naiad coffee tables are the ultimate collectible pieces offering lightness and richness in material and form. Naiades coffee table and side tables can be combined together in different configurations such as in groups of two and more, allowing personalized occasional table configurations and different rhythms can be achieved with variety of depths, widths, heights and materials. Naiad side tables are ideal companions and can be juxtaposed with the Naiad coffee tables; becoming a part of a curated form of expression or can be used as side tables next to other furniture elements such as sofas and armchairs.